A new challenge this week in Fortnite will bring you to new heights—quite literally. In the Fortnite Season 8 challenge to "Visit the 5 Highest Elevations on the Island," you're tasked with finding the five tallest peaks to be found in Battle Royale. 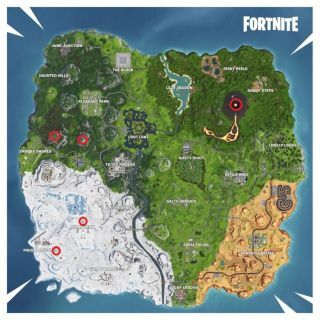 You can find all five peaks marked on the map above—the submarine near Frosty Flights, the top of Polar Peak, the hill east of Snobby Shores, the hill north of sports center, and the southern rim of the top of the volcano. When you visit these spots, you will find a sign marking just how high off of ground level each peak is.